Limestone and chalk. Often occurs in the dense shade of Oak woods. Used for hedging and topiary. Natural distribution throughout Britain and Ireland. Native to most of Europe, Asia Minor and North Africa. 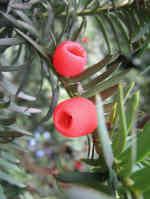 Irish yew is a variety with tall and narrow form. Brown very durable wood.Uses of wood - Used for furniture and for tool handles. Good firewood. Can fetch very high prices when ofright quality for veneer. Food and drink - All parts of the tree except red aril are poisonous to man and animals although deer browse young seedlings. Birds eat the arils and spread the seed. Deeply dormant seed needing treatment from collection in autumn to the spring of the following season but one (ie 18 months). 10,000 seeds per kg. Also propagated from cuttings and this may prove to be easiest method.